Staff Reporter: National and international experts have urged Bangladesh government and the traditional industries to adapt quickly with the rapid changing landscape of digital technologies. They said that Bangladesh’s industries on a perspective of global advancement, is significantly lagging behind; although quite encouragingly, Bangladesh’s factories have started moving from semi-automatic to more automatic set-up. Block chain technologies may have to profound impact on development-oriented investment, not only by revolutionizing global payment system but also through improvement to access to finance, supply chain management, digital identities or land registration. Addressing to an international seminar on “Industry 4.0: Transformative Technologies for Growth and Development” experts also said, Bangladesh has drawn global attention as a ‘development surprise’ for impressive economic performance and improvements in socio-economic parameters. It has to make more tangible progress in the areas of industrialization, education, health, trade, infrastructure, energy and power, ICT and other service sectors. Chief Guest of the seminar MD. Abul Kalam Azad, Principle Coordinator, (SDG Affairs), PMO, said that Bangladesh will be the 28th largest economy by 2030. Industrial development has a major role to play in realizing this potential as it will be a key driver for our economic growth. The Ready Made Garments (RMG) industry of Bangladesh has considerable strengths and immense potentials to complement this growth. He said, the vast land of Mirsarai and Feni EZ, which is the flagship project of BEZA, will be transformed into a green Economic Zone by the end of next year and it will then attract more investors. Kazi Aminul Islam, Executive Chairman of Bangladesh Investment Development Authority (BIDA) as Chairperson of the seminar presented keynote paper at the first session titled ‘Disruptive Technologies for Supply Chain Transparency’. He told, “While it’s excellent that we are responding to environmental needs, we must also make use of new patterns and fourth generation technologies including the advanced applications of information technologies in our supply chain management, i.e. IOT (internet of things). At the same time we have to enhance our productivity and efficiency, which requires technology upgrades and modernization of factories. In the second session titled “Block chain Technology for Economic Zones: Impact in Logistics, Finance & Production”, Mizanul Chowdhury, System Administrator & System Architect and Cloud Security, Massachusetts University of Technology (MIT) USA said, digitalization is expected to create a level playing ground between large and small businesses. Buyers across the world are demanding customized products. Manufactures, therefore, need to adopt mass customization strategies to respond with innovative products, which are delivered on time, while meeting global quality standard, and at the same price as mass produced ones. Vice Chancellor of Prime Asia University Prof. Dr. Abdul Hannan Chowdhury told, “We have a huge number of educated youths who are still unemployed. While it’s excellent that we are responding to environmental needs, we must also make use of new patterns and fourth generation technologies including the advanced applications of information technologies in our supply chain management, i.e. IOT (Internet of Things). Rubana Haq, Managing Director of Mohammadi Group said that the world is moving on. Automation is becoming a prime factor for economical development. The entire global investment in AI (Artificial Intelligence) is growing rapidly. Investors are injecting fresh money in this purpose. But Bangladesh has not required literacy level in AI. Looking further forward, she said, 3D printing technology is anticipated to bring major disruption in fashion manufacturing and retailing. Dora Sari, Research Fellow of Harvard Law School and Xiaoran Chen, Research Associate of Harvard Law School presented their research findings at the seminar saying that: it’s important not to get complacent about the fact that China is gradually shifting from basic to mid-range apparel because of growing production costs. While this may be an opportunity for Bangladesh to grow their market share in basic apparel, it can also keep us trapped in the lower-end of the market, as China gets relatively richer by selling more expensive apparel. Therefore, Bangladesh should closely observe how China is overhauling their RMG sector through the use of new technology, automationand advanced robotics to gain more competitive advantage and offer innovative products at lower prices. Mohammad Arfe Elahi, CTO, A2i said, most jobs of the future require significant skills training—and that is where more developed nations thrive. Therefore Bangladesh government is focusing on digitization of industrial sector. 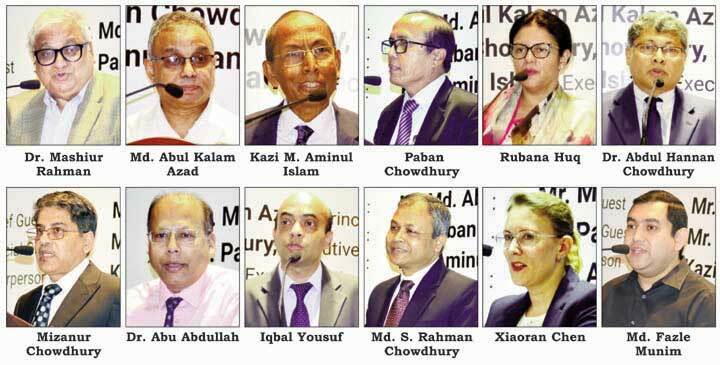 High level policymakers of the Bangladesh government i.e. SDG, BIDA, BEZA, A2i, ERD, BBS; executive members of different chambers and associations; business leaders of RMG, agro-processing, food processing, leather and pharmaceutical sectors; and high officials of public and private Special Economic Zone (SEZ) participated in the seminar held on 13 March, 2019 at the Hotel Intercontinental, Dhaka. Iqbal Yousuf of International Sustainable Development Institute, Boston, USA moderate the seminar.